Back around 1971, my friend Tim and I were the 'longhairs' at school. He was a fine musician playing Guitar, Classical Guitar and Flute among others and also owned a beautiful cherry ES335. He adored that guitar and I can understand why. Even then it had lacquer checking showing its age, and the clear mellow tone of the front pick-up was gorgeous. 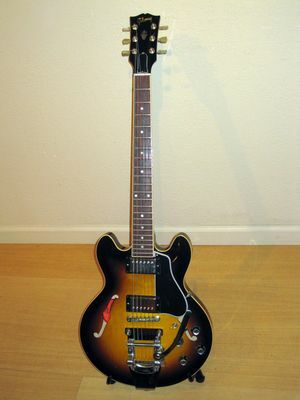 Of all the Gibson electric guitars, I always admired the ES335 the most. The ES330 seemed incomplete, with its full hollow body making it less useful live. Likewise, the ES345 had the extraneous addition of Stereo capacity. How many players actually used that feature? There are other 33-somethings with differing details, but fundamentally the 335 is the archetype. There are two significant varieties of ES335, the stoptail and the trapeze tailpiece. The trapeze version enables longer string length and has a softer feel. I believe the ES335 started as a stoptail, moved to a trapeze, and then back. I like both versions, but the stoptail is dominant these days, providing a little more stability. I own a 2006 'Dot reissue' sunburst ES335, which I have never used with the U.K. Subs, but it's one of the main guitars I use for my 'Jazz/Pop/Lounge' band Something Big. It's a very versatile instrument, at ease with both jazz chords and more biting rock. 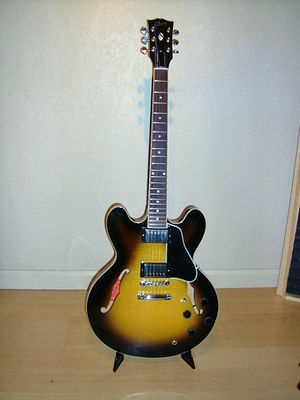 In 2007, Gibson custom shop launched the ES339, a smaller, more manageable size descendant of the ES335. For me it is the best new line for Gibson in decades. (For contrast look at the reverse V - surely someone was having a laugh or at least had run out of ideas). I'm not stuck on traditional designs, even though they are widely admired for good reason, rather I feel insufficient thought is brought to bare on new guitar designs. Manufactures tend to stick with tried and tested shapes, or just throw stuff out there in hope that they'll stick. The ES339 has a few changes from the ES335: the jack socket is now on the side, and it now boasts the so called Memphis Tone Circuit to retain the high frequencies at lower volume. (There's lower volume? - I've never tried that). Being a custom shop production, the attention to detail and finish is really first rate. Gibson also, as they do, offer an upgraded version for about $1,000 more, called the ES359 with extra embellishments. My 2008 ES339 has the 30/60 slim neck option and is a rich sunburst. Because the ES339 has a similar role as its big brother the ES335, I decided to modify my instrument. I have outfitted it with an EZ-Mount Bigsby tremolo, which serves not only to enable a tremolo effect, but has a tendency to make the sound a little more acoustic, with it's longer string length. EZ mount is made by ZZ guitar works and is a system of riding a Bigsby on a chrome plated mount, which negates any routing or drilling of the guitar. It is fully removable to restore the guitar to its stock condition. It works very well and looks great, but be warned, they are pricy. Still, for a custom shop Gibson, it's worth it. This guitar is one of my latest acquisitions and I'm enjoying it immensely. A Bigsby does raise tuning issues, but I'm currently addressing those issues by replacing the stock bridge with a roll type.